When the founder of the Vanderbilt dynasty, Cornelius “Commodore” Vanderbilt, died in 1877 he left his favorite grandson and namesake, Cornelius Vanderbilt II, a $5 million inheritance. 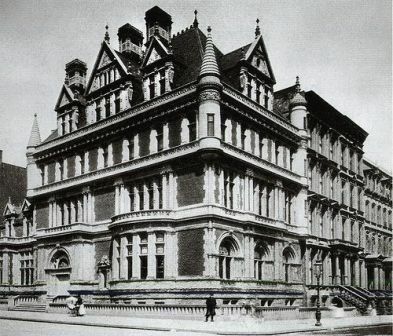 The following year Vanderbilt purchased and demolished three brownstone houses on the south west corner of 57th Street and 5th Avenue in preparation for his new mansion. Vanderbilt commissioned George Brown Post to design his grand home. 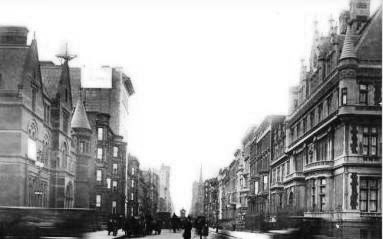 In a vast departure from the brownstone tradition of 5th Avenue, Post created a red brick and limestone chateau brimming over with turrets and dormers, deeply arched windows and highly ornate chimneys. The interiors were decorated by a team of artisans, among them the most esteemed names of the time: John LaFarge, Augustus Saint-Gaudens and his brother Julius, Frederick Kaldenberg, Philip Martiny, Rene de Quelin and Frederick W. MacMonnies. Alice Vanderbilt was acutely aware that the old New York society families with names like Schuyler and Van Rensselaer considered her family nouveau riche and therefore wanted a Vanderbilt coat of arms to be emblazoned in the entry hall for all to see. After months of research and finding no hereditary coat of arms, she simply made one up -- and a crest to go with it. For the 45-foot dining room Saint-Gaudens also sculpted wooden relief portraits including, according to the artist “…the young Cornelius and George Vanderbilt, Gertrude Vanderbilt, now Mrs. Harry Payne Whitney, William H. Vanderbilt, and Cornelius Vanderbilt, the first of the family.” Here the lower walls were paneled in oak, the upper portions covered in embossed, brown leather. A coffered ceiling hung overhead which Saint-Gaudens termed “superb.” It consisted of twenty panels, six of which were opalescent and “jewel” glass skylights by John LaFarge. The beams were inlaid with mother of pearl in a Greek key pattern. Green marble reliefs of Hospitalitas and Amicitia flanked the doorway, their faces, clothing and other details executed in ivory, iridescent metals and mother of pearl. Eight years later, upon the death of his father William Henry, Vanderbilt inherited another $67 million, adding to the fortune he was amassing as chairman of the family railroad empire. 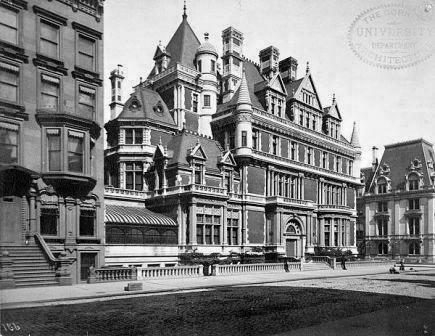 By the beginning of the 1890s, other millionaires were building palaces along Fifth Avenue which nearly rivaled the Vanderbilt chateau. Vanderbilt decided to enlarge. And a palace it was. With 130 rooms, four stories and an imposing corner tower, it was modeled loosely after the Chateau de Blois in France. The joining of the new addition to the original mansion was flawless and imperceptible. While the main family entrance remained at 1 West 57th Street, the grand port cochere entrance on 58th Street was used for social functions. Through the great iron carriage gates and around the circular drive would pass the carriages of New York’s most elite. According to Valentine’s Manual of Old New York "Visitors lucky enough to be on this spot during a social function will never forget the procession of smart equipages, drawn by blooded horses, and manned by liveried footmen and grooms, discharging passengers, each of them a society member of high standing." The interiors were meant to impress. The paneling and decorations of LaFarge’s original dining room were incorporated into the billiards room upstairs in the new section. 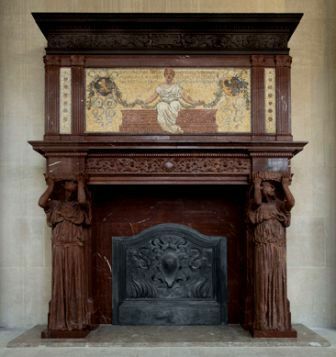 The main 40 by 50 foot entrance hall on the 57th Street side was faced in Caen stone “after the French style followed in the interior of the Chateau de Blois” (Saint-Gaudens’ magnificent mantelpiece had been moved upstairs to the new family sitting room). The library faced 5th Avenue along with two salons, one decorated in Louis XV the other in Louis XVI. On the 58th Street side was a Moorish smoking room designed by Lockwood de Forest – the walls encrusted with tiles and mosaics, the floors piled with Persian rugs. Mr. Vanderbilt’s office and a breakfast room were also on the ground floor. Rather than build a “picture gallery” as was the trend in millionaire’s homes, Vanderbilt lined the walls of his new dining room with his paintings. Here hung two Turners, Constable’s “A Castle on the River Wye,” two portraits by Sir Peter Lely, and works by Corot, Millais, Rousseau, Greuze and Ruysdael. The price tag in 1893 to enlarge his house was around $3 million dollars. And here this domestic couple lived happily until the morning of September 12, 1899 when Vanderbilt unexpectedly died. That morning, according to The New York Times, “A few minutes before 6 o’clock…he awoke and, arousing his wife, said to her: ‘I think that I am dying.’” Within five minutes Cornelius Vanderbilt II was dead of a brain hemorrhage. Alice Vanderbilt, according to The Times, “was prostrated” with grief and required a doctor’s care. She never entertained again in her grand ballroom. The windows were shuttered and the grand iron carriage gates were seldom opened, then only for funerals or close family events. Over time commercial buildings began crushing in on Alice’s mansion and in 1926 she sold it to Braisted Realty Corporation for around $7 million. A week before the wrecking ball was scheduled to demolish the 40-year old home, Mrs. Vanderbilt arranged to have it opened to the public for fifty cents admission which would be donated to charity. Guests signed the Vanderbilt guest book and ogled at the stained glass dome over the grand staircase and the French salons. A week later it was no more. Little survives of Cornelius Vanderbilt’s full-block chateau. The Saint-Gaudens mantle is in the Metropolitan Museum of Art, the grand carriage gates are installed at one entrance to Central Park, and some of LaFarge’s stained glass and other pieces were salvaged. 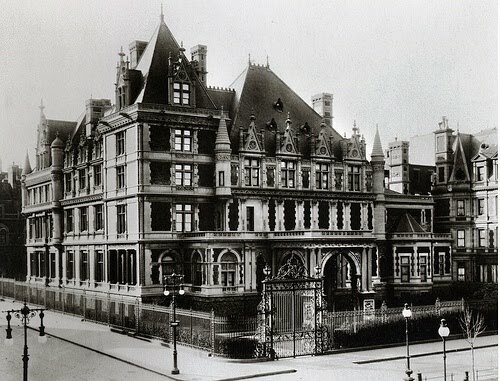 But the great bulk of the Vanderbilt mansion was demolished along with an irreplaceable page of New York City history. Do you think the paintings of the ballroom were destroyed with the buildings? could not they be sold instead? The information on the ballroom ceiling paintings was found in Wayne Craven's detailed book "Gilded Mansions: Grand Architecture and High Society" published last year. The information regarding the ceiling painting is found on page 146. The Vanderbilt mansion was full of the costliest and highest quality of architectural elements so many of the individual elements were purchased separately -- many of them going to Hollywood to be used as sets in period movies. With that in mind, there is a distinct possibility that someone recognized the importance of the paintings and had them carefully removed. However, I have found no documentation on the fate of he painting one way or the other. The original skylight in the LaFarge dining room was removed in the expansion. The three panels were shipped to Newport, "The Breakers", while the summer estate was under construction. About 1894 - the skylights were placed as a solid whole, installed and expanded by a NY firm over the grand staircase. The skylight still sits there today and the original three can be easily spotted. Period furnishings from the house as well as LaFarge portieres(drapes) among other things were relocated to Newport. Two Lely paintings were also moved to The Breakers, however, one is now in family possession while the rest of the structure and 13 acres of waterfront land are owned by The Preservation Society of Newport. Vanderbilt' granddaughters organized the sale of the house in 1972. Dear Ananymous, I would be interested in finding out what happened to the other 3 panels from the dining room. The article said that they were moved to the billiard room in the expansion and then salvaged after the house was sold and torn down. Can you tell me where I can get more information about the 6 panels and are there any pictures of the panels? Thanks. As I originally intended, I have supported the author; however, I am adding to his research through my own research - having visited and researched The Breakers in Newport, RI for the past several (six) years. The original house (NYC), as constructed, featured an elaborate arts and crafts program. The original dining room originally had three large stained glass panels created by John LaFarge. A nearby room, a long barrel-vaulted gallery, had a lengthy narrow stained glass skylight. When the Vanderbilts chose to remodel their townhouse beginning in 1892, all panels from both the dining room and the gallery were removed and shipped to Newport, RI. The pieces were retrovitted into a solid whole over the Grand Staircase in The Breakers. The LaFarge skylights can still be viewed in place today. The new dining room was made larger, vertically. A newer skylight was placed into the room, lightly detailed as the room itself was also an art gallery. The wooden paneling was removed from the original dining room and relocated upstairs in a billiard room (alongside the St. Gaudens mantel (as seen in a photograph in "Gilded Mansions" with fireplace adjacent to billiard table). The six wooden panels featured the name of family members. Salvaged, I am unsure of their whereabouts. Meanwhile, fragments of the Moorish room can be seen in the entrance lobby of the Landmark Theater in Syracuse, NY... the Petite Salon (one of the only original rooms from the first, 1884 townhouse and hardly updated in 1893-94 expansion) is now in fragments in the Midland Theater in Kansas City, MO. Various pieces of furniture were removed to Newport, RI and incorporated into the decorations and furnishings of The Breakers. Many pieces are still owned by the family to this day. The two Lely portraits, as described above, also were relocated to Newport in The Breakers. The Music Room and Morning Room were the only two rooms in the mansion to hold any sort of paintings as the mansion, itself, was designed to not carry any paintings (the climate in Newport during summer seasons proved unfavorable). One portrait remains in its original location: "Anne of Ditchly" by Lely, c1680. The other, unknown, though presumed in family possession. Hello. We own the Vanderbilt furniture from the Landmark Theater in Syracuse, NY. We bought it in the early 1970s. We are working on discovering provenance for this furniture. We would really love some help. I know that your note is from 2011, but hopefully you will get this. I can be reached at jill@katiespetproducts.com if you would be kind enough to reply. I believe the Lafarge panels that are currently at Biltmore, NC came from the main staircase at the father (William Henry Vanderbilt) mansion, also known as the Triple Palace. Thanks for all those interesting facts. Fascinating. Interesting indeed, but one question: I have always been given to understand from most sources that the Moorish Room is in the Midland Theatre also, and that fact is backed up by the National Register fact sheet for the Midland, which accurately describes the room there, down to the oil lantern hanging from the center. Can you clarify this? I'm interested to know more. According to Arthur T. Vanderbilt II in his "Fortune's Children," "Theater tycoon Marcus Loew purchased the colonial room and Moorish smoking room and stored them in a warehouse, proudly announcing his intention to put them to use in his new Midland theater in Kansas City." Given that the National Register confirms that the Midland's Moorish rooms is, indeed, the Vanderbilt room, I think we can be pretty sure it was salvaged and installed there. thanks for the very interesting note. enhancing. Markets usually purchase dozen or so. Show us more on Long Island Gold coast. Suddenly there were floor plans of the original G.B.Post Vanderbilt mansion. Also a view of what was called; the library as the viewer faces the fireplace. Post did an amazing job of designing a home with many needs to look vague and un-home-like on the outside. I think the arts and crafts original design was more interesting. The detail in wood and inlay on such a grand scale takes the viewers breath away. The same room photographed after the re-build shows the room in a very different mood. The bay window is completely covered in a gothic style stain glass mode. The ceiling is very different, very French, with a ceiling panel painted. The fire place, completely different with Karl Bitter roaring lions holding what appear to be ionic capitals holding a carved center piece above the mantel. This photograph appears in a forty year old book on New York Architecture. Described as the living room of the Vanderbilt house. The photo credit is given to; Black Starr. I wish there had been a record as to what happened to the Lafarge stain glass transoms. About a year ago there was a third floor floor plan of the original house on line. Under photographs of the C.Vanderbilt mansion. Printed on a beige background paper. There had to be more. Only the remodeled floorplans seemed available. A few days ago I was looking again and the original basement level, up to the dormers on the fourth floor. And also some new photographs of the house interior. The Moorish smoking room looking to the plaza. A hundred years ago the house still remained. I have to believe that some of the Lafarge glass panels still exist; unless Cornelius had them destroyed. A most peculiar man I believe. Afraid of something in life, happiness perhaps. He didn't do right by his family or himself. Whatever possessed the man; it was too much for him and he died relatively young. Leaving the family to fight over the money. Very sad family all. The money was spent by the time of my birth, 1950. And all because this stubborn man wanted things a certain way. John Singer Sargent's portrait of Cornelius Vanderbilt has been re-discovered and it is such a beautiful portrayal, that one wonders why the youngest child Gladys refused to acknowledge the portrait. The man is painted in beautiful colors, very kind looking. Was that the reason Gladys Vanderbilt refused to show it? Was he never to his children, the way he looked in the portrait; nice? The children never smiled in a photograph. No, wait! In the Breakers there is a black and white photograph of Gladys near the end of her life, and all dressed up and she has a very great smile. She didn't look like herself, she looked happy.